More than 1400 high profile guests will taste some of the finest foods that Northern Ireland has to offer at the British Embassy Summer Garden Party tonight at the Ambassador’s residence in Glencairn, Sandyford. The feast will be laid on by Tourism Northern Ireland for VIPs attending the prestigious annual event hosted by Chargé d’ Affaires, Mr Neil Holland. As a celebration of Northern Ireland’s Year of Food and Drink 2016, guests will sample a host of locally produced culinary delights including Portavogie Prawns, Glenarm Smoked Salmon, Comber Potatoes, Kilkeel Crab, Armagh Bramley Apples and Yellowman Fudge. 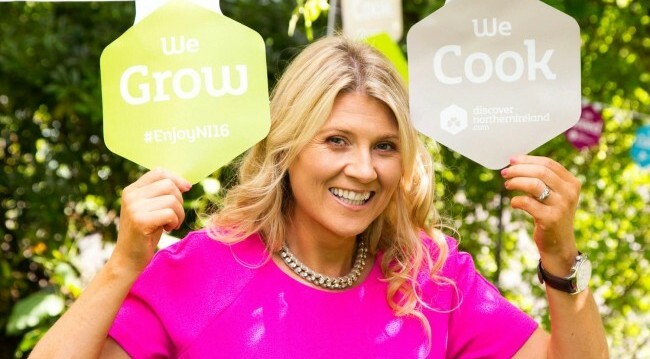 “This year’s British Embassy Summer party will provide a fantastic opportunity for us to showcase some of the delicious food that is available in Northern Ireland. We are very proud of our home grown produce so it was lovely to give guests the chance to indulge in a range of delicious food that is unique to Northern Ireland”. Highlights of the evening will include a celebration of Her Majesty the Queen’s 90th birthday, the 400th Anniversary of Shakespeare, wine tasting and music performed by Des Hopkins Dixieland Band and the Cross Border Orchestra of Ireland.